Accord owners are a tough, critical crowd. They know their cars and are brand loyal. In recent forum reviews of the 2014 Accord line-up, the EX-L V-6 Coupe stands out as an outstanding performance sports coupe value. The evolution of the Honda Accord as the cornerstone of the brand in North America comes as no surprise to Honda fans. Prior to the release of the Acura brand, Accord was Honda's high-mark as to style and performance in the early 1990s. While that may have changed a bit with the introduction of the Acura Legend, and subsequent models to follow, Honda has retained its own edge in the preservation of the Accord.The 2014 Coupe adds a bit of edginess to a model line that spans 9 generations of automotive re-engineering and body style upgrades. While not an RXS, the Accord Coupe offers wheel mounted paddle shifters, drive by wire technology and a 278 hp.3.5 liter V-6. All for a suggested msrp of $30,625.00 U.S..That’s 6-8 grand less than a comparably equipped Acura TL. While some Honda aficionados may complain about the tail light configuration, or the “ bling” sparingly applied to the exterior of the car, others will marvel at the full glass screen digital monitor display, the quality of the available leather seating with contrasting color hand stitching. On driving the Accord, you will be impressed by the effectiveness of the audio system active noise cancelling option, 6 speed automatic select-shift ( paddle shifters,) and the curve sensing, delayed transmission up-shift. In this case the weight to power ratio of the Coupe is more than ample. For drivers looking for decent performance and style on a tighter budget, the Accord LX-S Coupe offers a respectable 185 hp from an Eco friendly 2.4 liter 16 valve 4 cylinder, 6 speed manual transmission. Offering many of the standard features available in the EX-L, the entry level Accord Coupe is rated at 29 mpg combined city and highway and is a fun, reliable daily commuter. Want to take the adventure up a notch? Honda of North America offers the H.F.P. (Honda Factory Performance.) Consisting of 19 inch HFP alloy wheels, rear deck spoiler, lowered sports suspension package, full ground effects, red interior illumination and more. Think of it as a ‘tuner’ kit in a box. Add a performance chip, breather, turbocharger, waste-gate, exhaust, shift chip and you’re ready to roll. 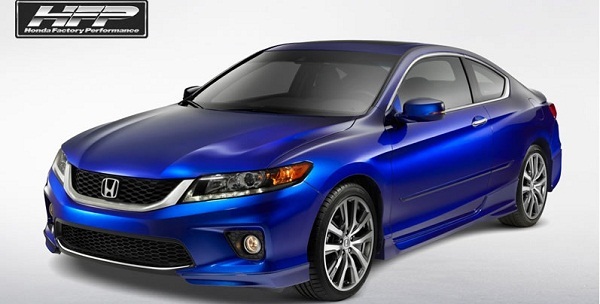 What do you think of the 2014 Honda line? Your thought provoking comment is always welcome at Torque News. You are right, but you are underestimating the Accord. There is no Acura sedan in production that can beat the Accord V6 in any performance metric. Drag race, road race, it does not matter. The V6 Accord can smoke all the Acuras. The ILX is an embarrassment. The TSX is nose heavy and won't turn, and the rest are just too heavy overall. Thanks John for chiming in. My "tuner" comment was for those that want to take the car into the 500 h.p. stratosphere. As you state, a great car. And I'll take that a step further. A great value. Except for a full ECU replacement, I have had trouble finding a a decent add on chip (not the $69 ones) or a Diablo Sport type of ECU reflasher for the later model Accords (ie; 2013 - 14) . Is there a reason for this or am I just web searching in the wrong places? Thanks in advance for your answers . Tony W.
Thanks Mike for droppin by. Great looking car. Does yours have a limited slip differential?